Abstract : China and Myanmar have recently signed a memorandum of understanding (MOU) to jointly build the China-Myanmar Economic Corridor (CMEC). Photo: China and Myanmar signed a MOU to jointly build China-Myanmar Economic Corridor on September 9. Photo provided by NDRC. 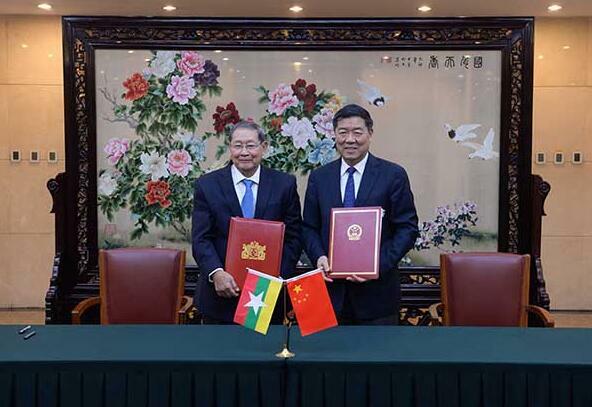 BEIJING, Sept. 12 (Xinhua) -- China and Myanmar have recently signed a memorandum of understanding (MOU) to jointly build the China-Myanmar Economic Corridor (CMEC). The CMEC, an important part of the Belt and Road construction, starts in north from China's Yunnan Province, goes down south to the central Myanmar city of Mandalay, and further extends east to the new city of Yangon and west to the Kyaukpyu special economic zone. The proposed CMEC will boost the economic development of Myanmar, alleviate poverty and bring more peace and stability to the Kyaukpyu area, said Song Qingrun, a researcher with the China Institutes of Contemporary International Relations (CICIR). According to statistics from China's Ministry of Commerce (MOC), the bilateral trade between China and Myanmar in 2017 totaled 13.54 billion U.S. dollars, a year-on-year increase of 10.2 percent. The trade volume between the two countries increased about 2.2 times between 1988 and 2017. From 2011 to 2012, China contributed 28 percent to Myanmar's foreign trade. From 2016 to 2017, the proportion increased to 40 percent. China remains the largest trading partner of Myanmar.